Wherever Jose Romero sets himself, he does so to experience it with passion and eagerness for constant improvement. That’s why this training chef has evolved his style, approach, and proposals while becoming one of the main professors of the School of Pastry of Barcelona (EPGB). In his purely savory side and in his recurrent incursions into the sweet world, both sides see each other for eclectic proposals which are fun and full of flavor. 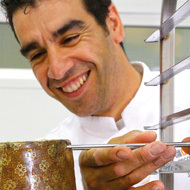 Also in the territory of fermented doughs, he has developed over the years an intense career that has led him to make organic breads with sourdough and become an international reference in the development of Panettone, also personalized and recreated in various ways thanks to his creative attitude . A good reflection of this dynamic and multidisciplinary personality can be seen in his book, “Ideas between pastry and cuisine”, published by Grupo Vilbo.